Bitesizes are small fish enemies that appear in the underwater levels of Donkey Kong Country. They are piranha-like in color with a reddish belly. Although they appear fairly weak, Bitesizes are as strong as other underwater enemies, including larger ones like Chomps. This is because Bitesizes are capable of injuring Donkey Kong and Diddy Kong by swimming into them, even to Enguarde. The Kongs cannot defeat Bitesizes by themselves, but Enguarde can defeat Bitesizes by stabbing them with his sharp bill. Bitesizes do not directly target the Kongs, and either swim left or right in a single direction, or move back and forth in an established pattern back and forth. Some Bitesizes move through the water slowly, while others go at a much faster speed. Regardless of their pattern, every Bitesize drifts slightly up or down while moving around. Bitesizes either appear by themselves, in pairs, or in large schools. Bitesizes appear in three of the four underwater levels, starting with Coral Capers, then Clam City, and lastly Poison Pond. The only underwater stage to not have any Bitesizes is Croctopus Chase. Bitesizes, as they appear in Funky's Fishing mini-game from the Game Boy Advance port. 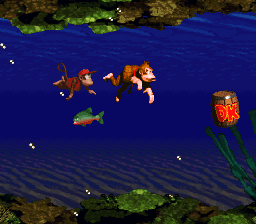 Bitesizes appear in the Funky's Fishing minigame in both the Game Boy Color and Game Boy Advance ports of Donkey Kong Country. The minigame is somewhat different between the two ports, which therefore includes the Bitesizes. In the Game Boy Color version, there are red, blue, yellow, green, and regular Bitesizes that Donkey Kong must fish for. His objective is to simultaneously catch Bitesizes of the same color. Sometimes multi-colored Bitesizes that flash between the aforementioned colors (except their standard appearance) appear on-screen, and they can be fished in with other Bitesizes for an added combo. 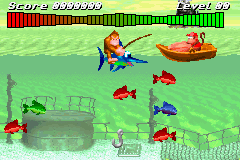 In the Game Boy Advance port, Bitesizes have the same role in Funky's Fishing if played from the main menu's Extras sub-menu. However, there are additional Funky's Fishing challenges in the main game, and a couple involve catching Bitesizes, or even avoiding them. This page was last edited on February 27, 2019, at 17:10.